This wonderful horseback riding tour will take you to explore the most beautiful area of Mazatlan, remote and unspoiled, you may not see another person outside of your group on this ride. 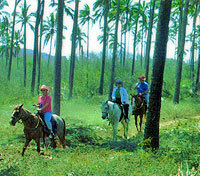 It is a very serene experience, riding your horse along the Pacific surf, and through beautiful coconut plantations. Located North of Mazatlan, this tour will give you a much different perspective and experience than other horseback riding tours, and is much more convenient for people staying in the North end of the Hotel Zone, such as Pueblo Bonito or El Cid. It is a family-owned and run ranch, where they own and care for all their own horses, the healthiest and best behaved in all of Mazatlan. Free pickup from your hotel or cruise ship! Return transportation via bus (10 pesos) or taxi is very easy. We'll set you up and show you where to go. We take only small, intimate groups. This is a great way to avoid the crowds and get away from it all! A wonderful horseback ride on Playa Bruja (Witch Beach), along Mazatlan's rugged and beautiful Northern Shore, with panoramic ocean views from El Mirador, through Coconut Plantations and scenic mountain views from Punta Cerrita. Never been horseback riding, or want a refresher? We include free lessons! Enjoy lunch, a cold coconut or an iced beer under a palapa roof at Mr. Lionso Restaurant after your ride...shrimp lunches to die for! Cruise Passengers: This tour makes a great shore excursion. Includes free cruise ship transportation. Extra money for drinks, lunch, and tips. Restrictions: Weight Limit 240 lbs. Not recommended for pregnant women or people with severe back problems. If you're staying on the North end of the Hotel Zone, such as Pueblo Bonito, El Cid, etc, this ride will be much closer to you than Stone Island. If you're already doing the Stone Island Tour, you might choose this horseback riding tour to give you a change of scenery. About 10 minutes North of the Golden Zone, about 20 minutes from the Cruise Pier.